Roger and Beth Maulik have watched Alzheimer’s disease take the lives of a number of Beth’s immediate family members. Now, the memory disease has also struck Beth. Today, she manages mild Alzheimer’s symptoms and helps care for her brother, Father Jim Fangman, who is at a more advanced stage of the illness. Beth is also working with Roger to raise awareness in their parish and six St. Paul neighborhoods about those living with Alzheimer’s and related dementias and their caregivers as part of a statewide collaboration called ACT on Alzheimer’s. The Mauliks, who belong to Lumen Christi in St. Paul, also are thinking about the future. An estimated 5.2 million Americans and roughly 100,000 Minnesotans live with Alzheimer’s. 1 in 9 Americans age 65 and over has Alzheimer’s. 1 in 3 Americans age 85 and older has the disease. Alzheimer’s is the sixth leading cause of death in the United States and the only cause of death in the top 10 that can’t be prevented or slowed. There are more than 15 million caregivers in the United States. By 2050 the number of Americans with the disease could triple. Alzheimer’s will cost the nation $203 billion in 2013. It is expected to cost the United States $1.2 trillion by 2050. Source: Alzheimer’s Association, 2013 Alzheimer’s Disease Facts and Figures, Alzheimer’s & Dementia, Volume 9, Issue 2. As the number of Minnesotans with Alzheimer’s and related dementias is predicted to increase significantly, at least eight communities, including St. Paul, are starting to prepare for the budgetary, social and personal consequences by assessing needs. The communities are helping local faith groups, organizations and businesses respond, said Georgia Lane, coordinator for St. Paul Neighborhoods ACT on Alzhei­mer’s (SPN ACT) and Dementia Pathways program director at Carondelet Village Care Center in St. Paul. Carondelet Village, which offers senior and memory care as well as community outreach to seniors, convened St. Paul’s involvement in February, she said. The initiative is “talking about communities in the broad sense, not just health care [facilities], hospitals, clinics and senior housing companies, but how do we look at faith communities and how do we look at our first responders?” she said. “How do we look at the neighbor on the street or the bank teller who’s interacting with people with dementia? . . . The impact is going to be just growing,” she said. One goal is to help organizations in the Highland Park, Mac-Groveland, West Seventh, Summit Hill, Summit University, and Union Park neighborhoods of St. Paul to become informed, safe, respectful — and to provide the best quality of life options — for individuals with dementia, their families and caregivers. Fifty volunteers representing a range of community sectors are conducting surveys with tools supplied by ACT on Alzhei­mer’s, which was initiated by the Legislature in 2009. Increasing awareness and understanding of the diseases and their warning signs is critical, Lane said. dementia, said Nancy Shatek-Suek, pastoral care coordinator and an SPN ACT team member. The parish wants to ensure it reaches members not directly affected by Alzhei­mer’s or dementia because the disease can be confusing or even frightening for people not familiar with it, Shatek-Suek said. Faith communities can play an important role in helping those living with Alzheimer’s/dementia to connect with senior services, said Nancy Utoft, executive director of Ramsey County Senior Services Consortium and an SPN ACT team member. “The more we can be aware of identifying dementia early and connecting people with services as they need them or anticipate their needs, we can avert crises in the home and have people remaining in their home … as long as possible, and also their economic resources will last longer,” she said. The senior service program Meals on Wheels of Ramsey County not only provides those with memory loss with nutrition and wellness checks, it creates helpful routine in their lives, Utoft said. Businesses and other organizations need to know how to treat those living with Alzheimer’s/dementia, Roger Maulik said. SPN ACT on Alzheimer’s also seeks to raise awareness and increase support for caregivers, since 70 percent of those living with Alzheimer’s/dementia are cared for at home, Lane said. Roger Maulik said he would like to see faith communities offer programs and prayer groups for people living with the disease and their caregivers as well as senior groups that accommodate people with memory issues. SPN ACT on Alzheimer’s volunteers will complete the assessments in July and plan to implement action goals over the next 12 to 18 months, Lane said. So far, feedback shows that “faith communities are really hungry for this work — to know that there’s a group out there that is really trying to say, ‘OK what kind of things can we do to improve the lives for people living with dementia?’” she said. 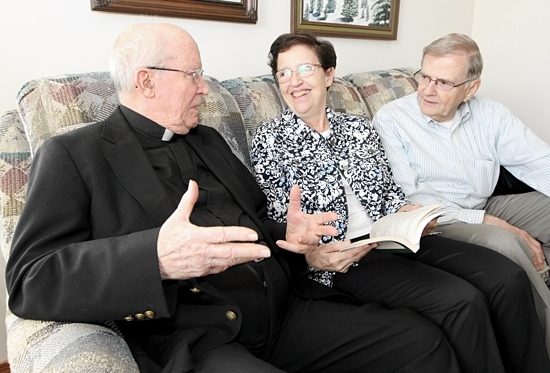 The Mauliks say their Catholic faith helps them face the effects of Alzheimer’s each day. “I was raised a very strong Catholic and if I didn’t have my faith to hold me up I’d be a mess,” Beth said. Find out more about SPN ACT on Alzheimer’s and efforts in other parts of the state at http://www.actonalz.org.